News > Electric > Kit Carson Electric Cooperative Helps Aid Federal Employees During Furlough. 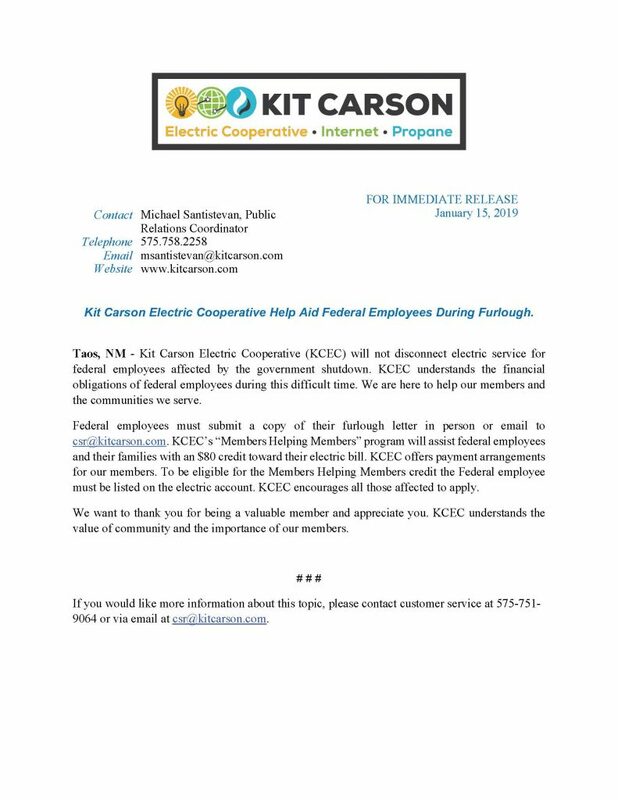 Kit Carson Electric Cooperative Helps Aid Federal Employees During Furlough. Kit Carson Electric Cooperative Help Aid Federal Employees During Furlough. Taos, NM– Kit Carson Electric Cooperative (KCEC) will not disconnect electric service for federal employees affected by the government shutdown. KCEC understands the financial obligations of federal employees during this difficult time. We are here to help our members and the communities we serve. Federal employees must submit a copy of their furlough letter in person or email to csr@kitcarson.com. KCEC’s “Members Helping Members” program will assist federal employees and their families with an $80 credit toward their electric bill. KCEC offers payment arrangements for our members. To be eligible for the Members Helping Members credit the Federal employee must be listed on the electric account. KCEC encourages all those affected to apply. We want to thank you for being a valuable member and appreciate you. KCEC understands the value of community and the importance of our members. If you would like more information about this topic, please contact customer service at 575-751-9064 or via email at csr@kitcarson.com.